1. Count your blessings is the theme of the season! So we're throwing it back to our fun and modern Thanksgiving-inspired rehearsal dinner here on Tidewater and Tulle. 2. This Apple and Bourbon Punch recipe on The Bride Link will literally warm your heart… and your toes! Three cheers to the hostess who shows her thanks with this one! 3. Planning an engagement party this time of year? There's nothing cozier than a harvest-inspired one like this one on Southern California Bride. 4. Engaged and know that hosting a Thanksgiving dinner for loved ones is in your future? 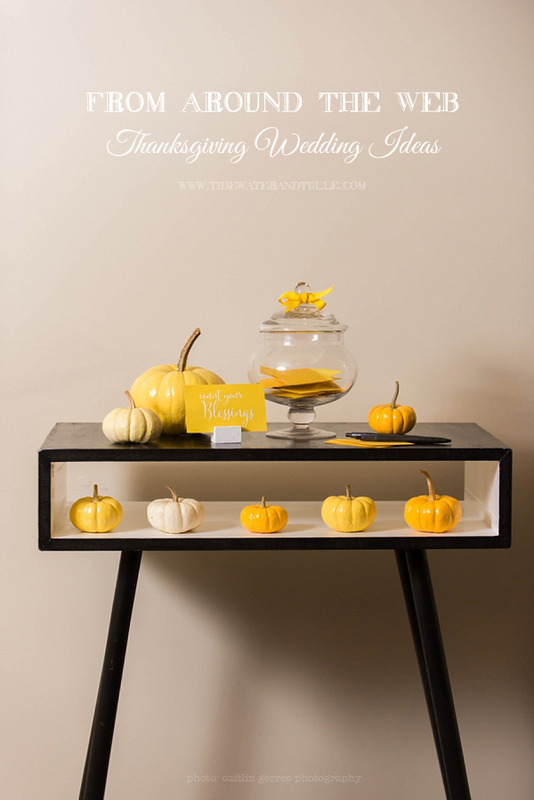 Think ahead and look at these Turkey Day hosting must-haves from Kiss My Tulle are on your registry! Your future self will thank you. 5. A true show of gratitude, Christie of Mountainside Bride shares her thankfulness for following her heart on her wedding day and reminds us of the core reasons a wedding takes place. 6. Me oh my, it's pumpkin pie! This deliciously warm-in-tone tablescape inspiration on The Perfect Palette hits all the right notes for the holiday of thanks. 7. These 25 Ways to Give Thanks at Your Wedding on Bridal Guide show that we can always find opportunities to show gratitude-- in little or big ways! 8. Thank You Cards may be the most obvious way to show your appreciation, but they are definitely not any less important than the rest! Here at Tidewater and Tulle, we featured Thank You Card Etiquette as well as a free card printable to get your thanks a pretty start. 9. Any fall-inspired table inspiration is a goodie, especially when paired with metallics and textures of the season, especially this one on Hey Wedding Lady. 10. Whether you're a crafty person or just completely techie, these creative ways to say thank you on Martha Stewart Weddings are always in style, no matter the holiday. Have something to share that you're grateful for? Post below in a comment! Photo by Caitlin Gerres Photography. For the entire handmade and modern rehearsal dinner inspiration and vendor credits, head over to the full feature.